Brandy, the 4-year-old pit bull who spent almost a year living in a shelter, with her new family. 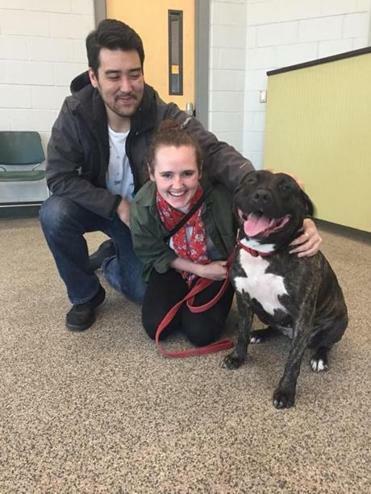 Brandy, a 4-year-old pit bull who lived in the MSPCA’s Boston shelter for nearly a year but never overstayed her welcome, was finally adopted Wednesday. And she seemed doggone happy about it, the MSPCA said. Brandy spent 361 days getting to know the employees and volunteers who walked, fed, and cared for her daily, and she was one of their favorite animals in the shelter, MSPCA spokesman Rob Halpin said. So when a Boston woman walked in the shelter to take Brandy home, it was bittersweet for the staff, Halpin said. Brandy ended up in the shelter when her owner was forced to move homes, Halpin said, which is the No. 1 reason why animals are surrendered to the MSPCA. The pit bull was struggling with “spay incontinence,” a urinary tract abnormality that can cause dogs to urinate in their owners’ homes. Luckily for Brandy, the medication used to treat spay incontinence is relatively inexpensive and easy to administer, Halpin said. And after reading about Brandy on the MSPCA’s Instagram account recently, one family decided to pay for one year’s worth of the medication. But they didn’t adopt her. “There were lots of close calls and meet and greets, but there are so many other dogs who are perfectly healthy and ready to go home,” he said. Brandy also had a hard time getting along with other dogs, Halpin said, drastically reducing the pool of people who might be interested in taking her home by eliminating families who already have pets. While Brandy’s year-long caretakers will miss her company, they were relieved to see her find a home outside the shelter, which can take a toll on a dog’s personality, Halpin said. With other animals constantly coming and going, there are new sights and smells to adjust to every day. “It’s a real mark of her solid makeup that her personality stayed intact for a year,” he said. The new owner saw photos of the pit bull on Instagram and fell in love, Halpin said.